In keeping with the spirit of the Aurora Prize for Awakening Humanity, the Aurora Dialogues shine a light on the people who are working to address today’s atrocities in a real and substantial manner and seek to identify ideas that will deliver tangible change. Now in its third year, the Dialogues encourage collaborative conversations to explore the importance of learning from the past, acting in the present, and fostering a better future. Founded on behalf of the survivors of the Armenian Genocide and in gratitude to their saviors, the Aurora Humanitarian Initiative seeks to empower modern-day saviors to offer life and hope to those in urgent need of basic humanitarian aid and thus continue the cycle of giving internationally. The Aurora Humanitarian Initiative is Gratitude in Action. It is an eight-year commitment (2015 to 2023, in remembrance of the eight years of the Armenian Genocide 1915-1923) to support people and promote projects that tackle the needs of the most helpless and destitute, and do so at great risk. This is achieved through the Initiative’s various programs: The Aurora Prize for Awakening Humanity, the Aurora Dialogues, the Aurora Humanitarian Index, the Gratitude Projects and the 100 LIVES Initiative. The Aurora Humanitarian Initiative is the vision of philanthropists Vartan Gregorian, Noubar Afeyan and Ruben Vardanyan who have, already in the second year, been joined by several dozen new donors and partners. The Initiataive welcomes all who embrace a commitment to our shared humanity. The Robert Bosch Stiftung GmbH is one of Europe’s largest foundations associated with a private company. In its charitable work, it addresses social issues at an early stage and develops exemplary solutions. To this purpose, it develops and implements its own projects. Additionally, it supports third-party initiatives that have similar goals. The Robert Bosch Stiftung is active in the areas of health, science, society, education, and international relations. Moreover, in the coming years, the Foundation will increasingly direct its activities on three focus areas: Migration, Integration, and Inclusion, Social Cohesion in Germany and Europe, Sustainable Living Spaces. Since it was established in 1964, the Robert Bosch Stiftung has invested more than 1.4 billion euros in charitable work. 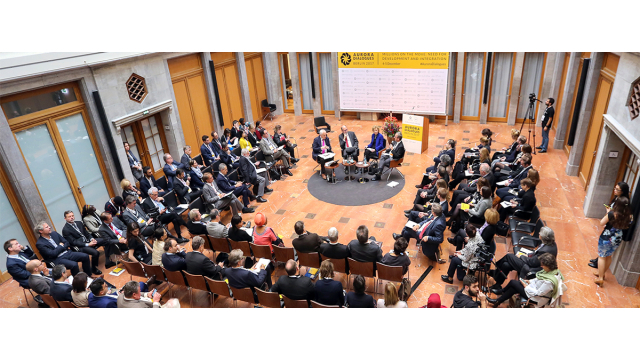 The Global Perspectives Initiative pursues the goal of fostering the discourse about a sustainable, balanced and fair global development and by this, actively supports Germany’s contribution to the fulfillment of the UN’s Sustainable Development Goals of 2015. 11 out of 17 Goals are relevant to migration and refugees, which fosters the relevance for an international commitment for the SDGs and a better and more balanced development. Stiftung Mercator is a private and independent foundation. Through its work it strives for a society characterized by openness to the world, solidarity and equal opportunities. In this context it concentrates on strengthening Europe; increasing the educational success of disadvantaged children and young people, especially those of migrant origin; driving forward climate change mitigation and promoting science and the humanities. One of Germany’s leading foundations, it is active both nationally and internationally. Stiftung Mercator feels a strong sense of loyalty to the Ruhr region, the home of the founding family and the foundation’s headquarters. In 2017/2018, European Migration Policy is Stiftung Mercator’s focal topic.